1997— The sound of the general alarm bell reverberated through the ship. At 2:30 AM, this couldn’t be a drill. Even more puzzling, we were still dockside in Halifax, four hours from our scheduled departure for the Labrador Sea. Almost immediately, I heard the captain’s phone ringing in the adjacent stateroom—a sound that would become familiar over the next seven weeks. I wondered: Is this an omen? Should we reconsider this attempt to study wintertime oceanography in one of the harshest areas of the world ocean? 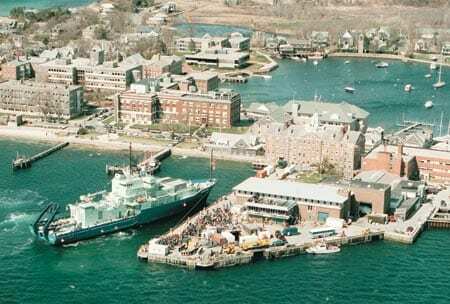 As it turned out, four of Knorr’s six preheaters had failed, and WHOI’s port office delayed our departure to allow necessary repairs. This was the first of many challenges we would face during this difficult experiment. It was also the first of many instances of good luck that would impact our success (had the heaters failed in the middle of the cruise, the consequences could have been severe). The goal of our experiment was straightforward enough: Observe wintertime convection in the Labrador Sea. This had been done only once before, nearly 20 years ago, by a group from Bedford Institute in Nova Scotia, at the end of the winter season. Convection is the sinking of dense surface water to great depths where it forms a newly replenished water mass. It occurs in only a few locations, but is crucial in driving large-scale ocean circulations that affect Earth’s climate system. In the Labrador Sea, bitter cold winds blowing off the Canadian coast chill surface waters and remove enough buoyancy to cause convection. This harsh weather is, of course, the very reason for the dearth of direct observations of this phenomenon. Our cruise’s objectives included characterizing the atmospheric forcing as well as the ocean’s response. Thus we needed to be present during the heart of the winter season. 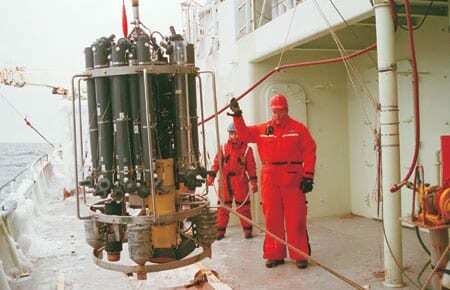 Our primary at-sea operations included Conductivity/Temperature/Depth (CTD) rosette sampler deployments, shipboard and weather-balloon atmospheric measurements, and drifter launches. Despite many months of preparation by both science party and Knorr crew, we would be leaving Halifax with a bit of uncertainty. This was perhaps fueled by many of our peers’ perception of the experiment as one of high risk that included the possibility of complete failure. Indeed, a relentless effort had been required over several years to acquire funding for the cruise. The common opinion was that, while the scientific objectives were worthwhile, we would spend a good portion of the cruise hove to because of the weather and the ice, and thus accomplish few (if any) of our goals. 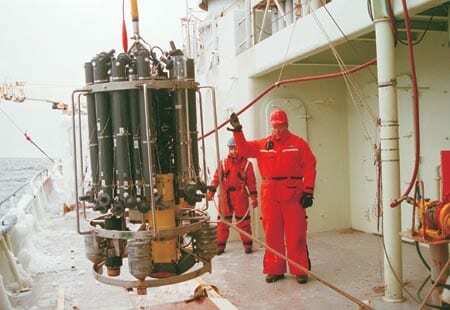 In the end, two factors played major roles in allowing us the chance to investigate the wintertime Labrador Sea: The cruise was part of a cooperative experiment that would provide a platform for numerous collaborations, and it was funded by the Office of Naval Research, which has a history of supporting high-risk science. We departed Halifax on February 2, 1997. The weather quickly soured shortly after we rounded the tip of Newfoundland on our way north. Before reaching our first station, we encountered a band of pack ice blocking our path. Thus occurred our second challenge on this young cruise, one that addressed the central issue of the experiment: Was the 278-foot Knorr really capable of operating in such an environment? While an ice breaker was not appropriate for our work, since most of the Labrador Sea is ice-free, we did consider the possibility of an ice-strengthened vessel. However, the vast majority of research vessels are not of this class, and logistics prevented such an option for our experiment. While Knorr had certainly operated in adverse conditions often enough and had recently undergone a major conversion, the combination of so many different factors—intense storms, icebergs, pack ice, subfreezing temperatures—made the Labrador Sea uniquely challenging. It was the lack of experience in such conditions, as much as the design of the vessel, that lay at the heart of the issue. Our encounter with the ice pack brought this point home just three days into our cruise. But rather than put a damper on our prospect for success, Captain A.D. Colburn and his crew turned the experience into a positive one, and from it emerged a proper and safe strategy for working in the vicinity of the ice pack. In the end, this type of positive reaction to a difficult challenge more than made up for any lack of experience working in such climes. During the planning stage of the experiment we needed to estimate how many stations would likely be occupied. We cautiously put the number somewhere between 60 and 80, with the latter considered somewhat optimistic. The prospect of frequent storms traveling across the Labrador Sea prompted a liberal prediction of “weather days,” when we would be hove to, unable to work. We ended up planning on one weather day for every four working days, which was part of the reason for the 47-day length of the cruise. We were, of course, hoping to do a bit better than this, in part because long-term predictions called for a fairly mild winter in the Labrador Sea. In fact, the month preceding our cruise was abnormally warm, and there was widespread belief that the entire winter would be the same. This was a bittersweet prospect: While we might obtain a multitude of measurements in fair weather, we might also never witness the deep convection we hoped to see. 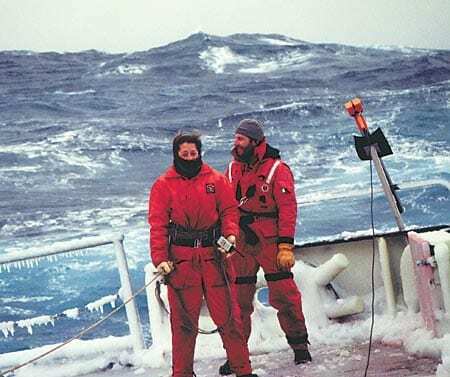 However, by the end of the first week of the cruise two things became evident: Winter 1996-97 would not be weak, and R/V Knorr and its crew would prove resilient to every challenge thrust upon them. During the five-week period of occupying stations in the Labrador basin, we experienced classic wintertime convective conditions. The air temperature rose above freezing only once, on our last working day (the average was 18°F). Not until our fourth week did we experience a sunny day—one of two during the entire cruise. It snowed constantly. One of the conditions we had hoped to observe during the experiment is known as a cold-air outbreak, in which bitter cold air blows from the west off the continent and cools the relatively warm ocean water. The mild predictions made us wonder whether we would witness even one of these events, but our worry was unwarranted. As one of the meteorologists on board put it, we experienced these conditions almost continually during the cruise. What did this mean in terms of working on deck? While the sea-state wasn’t as bad as one might imagine based on the strength of the winds, which averaged 23 knots, the combination of extreme temperatures with sea spray and wash made it an ongoing struggle to conduct safe operations. 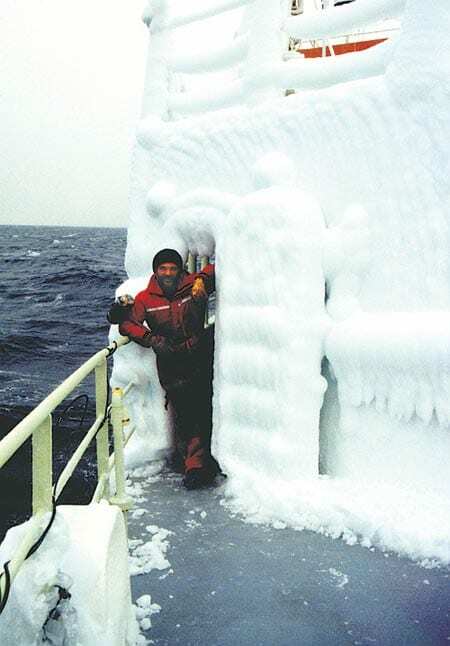 Under these conditions it doesn’t take long for ice to build up on the exterior of the ship. This causes two problems: a dangerously slick deck and a potentially top-heavy ship. The sand we brought along to spread on the deck lasted only until the next wave washed it off. During the most difficult periods we set up a safety line to tether those who had to work outside. One memorable example of the foul-weather deck procedure occurred during our first approach to Greenland, on a day that was harsh even by Labrador Sea standards. As we crossed over the continental slope steaming towards shore, we wanted to drop expendable temperature probes to determine where to sample more thoroughly on our way back offshore. Every 6 minutes two watch-standers would radio the bridge, step out onto the fantail into the horizontally driving snow, and hook themselves onto the safety line. Watching this scene, I couldn’t help but wonder in amazement that we were actually taking measurements in such conditions. This is what so many people thought would be impossible, yet here we were, in full operation, with the ship steaming at 10 knots. The second (and less obvious) danger associated with ice buildup was the added load to the ship above the water line, which impacts the stability of the vessel. To deal with this we brought along a supply of wooden mallets, which were used extensively by the crew (with occasional help from the science party). This was a new experience for everyone on board, and it proved to be grueling work. It would take a group of six to eight people the better part of a day to bang all the decks, bulkheads, and bulwarks free of ice. During one such session, we estimated that roughly 15 tons of ice—over 10 inches thick in some places—were cleared from the ship. Not surprisingly, the novelty of this task wore off quickly. To make matters worse, the supply of mallets dwindled due to breakage and loss overboard. However, the crew’s resolve never faltered. And their dedication to the success of the experiment was exemplified by the fact that all the ice removal was done within the framework of the science operation: Never once was the timing of our measurements impacted. Our successful science operations in light of the harsh weather and difficult conditions on deck depended on a combination of factors: well-established procedure, proper equipment, efficient layout of the ship, and a positive attitude. The Knorr crew had spent the better part of the last five years participating in the World Ocean Circulation Experiment (WOCE), perfecting their capability for hydrographic operations. This expertise had a huge impact on our experiment. Simply put, when you are that good at something it is less daunting to do it under adverse conditions. This applied to everyone, from the captain and watchstanders on the bridge to winch operators. A member of the science party had wondered prior to the cruise about the potential for instrument package sensors to freeze on deck before deployment, but this proved not to be a problem because launches were carried out quickly and efficiently. The package was moved out of a heated hanger on a set of rails, and moments later the seaman on watch would jointly maneuver the winch and hydroboom, lowering the package into the water at the proper moment according to the timing of the swell. This, of course, was facilitated by skillful station-keeping on the bridge, crucial under such circumstances. Then there was the can-do attitude that prevailed among both crew and science party. It seemed as if nothing could stop us, not the repeated freezing of blocks or air-tuggers, not the relentless pounding, not the dreariness of day after day with no sun. Maybe some of this was good luck. Without a doubt, much of it was sheer determination. During our five week tour of the Labrador Sea, we zigzagged repeatedly between the Labrador and Greenland coasts. On the Greenland side the biggest worry was icebergs. As the winter season progresses, the West Greenland Current tends to carry icebergs around the tip of Greenland up along the coast. This winter was no exception. During our second visit to Greenland, icebergs cluttered our study area. The threat is not from the large bergs, which are easily detected on radar, but from the smaller pieces known as bergy bits, particularly at night. Factor in strong surface currents, unpredictable snow squalls, and our need to occupy stations only a few kilometers apart, and it added up to a constant challenge for the bridge. At one point we had to change plans because an iceberg was occupying our proposed station! On the Labrador side we were faced with the ice pack, perhaps the most difficult obstacle of the cruise. The goal had been to occupy stations right up to the edge of the pack, for there the atmospheric forcing is largest and very few wintertime measurements existed (none in harsh conditions). We knew that the ship wasn’t capable of penetrating the pack ice—but there was never a clearly defined edge. Several miles before the true pack we would encounter chunks (called growlers) and bands of ice, in some cases tens of yards wide. With an ice-strengthened hull we could have cruised right through the bands, but with Knorr we had to work our away around them. It was here that we encountered the coldest weather of the cruise, down to 2°F. And contrary to common belief, the sea state was not calm in this area. In addition, surface currents were as strong as on the Greenland side. On our third and final approach to the ice edge, near the end of the cruise, the bridge made a special effort to reach the continental shelf, our desired goal. After spending several hours steaming around the ice-bands and growlers, the Captain signaled to us that this was as far as we would go. As we occupied our station—with a sense of urgency—ice chunks and growlers drifted by the ship. Had one of them hit the cable holding our package, it would have cut the wire in an instant. The bridge constantly juggled the tasks of keeping the ship oriented properly with the wind and avoiding the onslaught of ice (some pieces as big as cars). Halfway through our cast the captain radioed down to urge us to speed things up—we didn’t need to be told. Going to sea will never be routine; it is an inherently dangerous endeavor. But after many cruises one can begin to become complacent because of the familiarity of the operation, the deftness of the crew, the sophistication of the instruments used to run the ship. Our winter cruise to the Labrador Sea was an adventure. We didn’t know if we would observe deep convection, or even to what extent we’d be operational. It was a striking reminder that oceanographic research is sometimes daring, and certainly carries risks. As we approached the Labrador ice edge for the first time early in the cruise, it was the middle of a bitter cold night. The satellite maps had given us a prediction of the ice edge location, and as we neared this spot all eyes on the bridge intensely scanned the horizon. Then, in a shockingly brief amount of time, a storm blew up, bringing snow that reduced visibility to zero. On the bridge, feeling the ship heave up and down and knowing that we were just miles from the ice, a range of emotions came over me—complacency was not one of them. But, glancing at Captain Colburn, I could sense his extreme confidence in his ship and crew and their ability to deal with this situation. It was clear at that moment that we had indeed chosen the right vessel for this experiment. Before the cruise ended on March 20, we would occupy more than twice our planned number of stations and take home a truly unique and fruitful data set. It is ironic that all this was done under the harshest of conditions and amidst significant skepticism. Our experiment will surely advance our understanding of convection in the Labrador Sea. I hope that it also advances the perception of our research fleet’s ability to push new horizons. Robert Pickart is an Associate Scientist in WHOI’s Physical Oceanography Department. It has been unfairly claimed that he always sails in bad weather—a reputation that the Labrador Sea cruise did not help to dispel! As we were editing this issue, Bob, who lives in Falmouth, Massachusetts, with his wife and four children, was aboard Knorr again—on a summertime cruise for WOCE that began in Halifax, but steamed south, toward Trinidad. Captain A.D. Colburn, right, crew member Bill Dunn, and others wield their ice mallets on Knorr's foredeck during the Labrador Sea cruise. First mate George Silva takes a break from pounding ice to admire his work. This section of the starboard bulkhead was particularly susceptible to ice buildup. Chief Scientist Bob Pickart, center, Sarah Zimmermann, right, and Dan Torres launch a profiling vertical current meter in 45 knot winds. 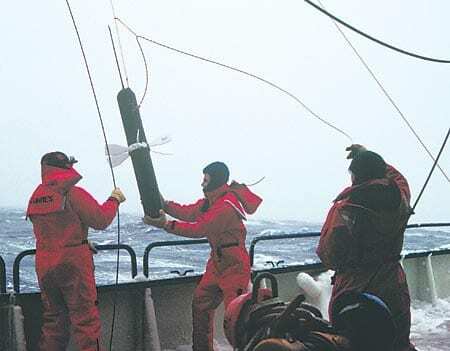 Float launches are typically done over the fantail, but the Labrador Sea's harsh conditions required a safer, more controlled procedure using thestarboard hydroboom. CTD chief Marshall Swartz and watchstander Shelley Ugstad help guide the CTD package off the deck during a Labrador Sea deployment. The staging area, including the two rails used to bring the package out of the hanger, needed to be cleared of ice before virtually every cast.